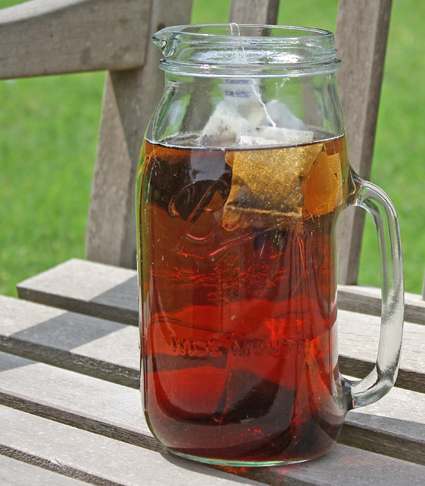 FoodBasics101: A Fun Summer Activity- Make Sun Tea! A Fun Summer Activity- Make Sun Tea! Sun tea is one of my family's favorite summer beverages...plus it's fun to make! Sun tea has a smoother taste than that of regular iced tea due to the sun's gentle warming of the water. Fill a gallon-size clear jar or sun tea jar with water. Add eight regular-size tea bags and two of a flavored tea to the jar. Orange-spice, black currant, or raspberry tea works well. Place the jar outside on a table, in the sun for three to four hours being sure to cover the jar with the lid or plastic wrap. The sun will gently heat the water, slowly steeping the tea. As soon as the tea is as strong as you like, bring it inside and remove the tea bags. Sweeten the tea to taste and place the jar in the refrigerator to chill. Enjoy! This looks like fun, my kids would love it! Thanks for visiting my blog. I'm following you on facebook. Hi! I’m Sherri Ledbetter. I write FoodBasics101 to help beginner cooks learn the basics of cooking and baking. I’m a self-taught home cook, who began my kitchen adventures as a teen in the '70s. Welcome! Have a food-related product you would like me to review? Maybe a recipe you'd like me to write about? Email me! Ask, learn, and share...if you have comments or questions please post them in the comments section or email me at Sherri@FoodBasics101.com. I'm eager to hear from you! Keeping foods cold at a picnic or party. Starting A Charcoal Grill- For Newbies! Bread Boxes-Keep your bread fresh longer. ©Copyright 2011, FoodBasics101/Sherri Ledbetter. All Rights Reserved. Powered by Blogger.